U.S. stocks were set to open lower Wednesday, as investors reacted to disappointing economic reports. Investors continue to watch for more signs of a slowdown in the economy, with hopes that the data could convince the Federal Reserve and central banks around the globe to step in with further stimulus measures. Consumer prices were unchanged in July, according to the Bureau of Labor Statistics. The government's key inflation measure came in below expectations, with a forecast of a 0.2% increase. Meanwhile, Empire State manufacturing fell 5.85 in August from a 7.4 rise the month prior. Economists were expecting a positive reading of 5.0. U.S. stock futures fell further in the red following latest reports. "It seems markets are starting lose some of this week's gains, as investors start to weigh the likelihood of further QE (quantitative easing) in the face of continued mixed economic data out of the U.S.," said Michael Hewson, senior market analyst at CMC Markets. "Given that we are at or near four-month highs on some of the major benchmarks, the momentum clearly isn't there to signal significant further gains." For now, trading volume remains low, and many investors aren't placing significant bets with the market in light summer trading. U.S. stocks pared gains during the final hour of trading Tuesday, finishing the day barely changed. World Markets: European stocks fell during Wednesday's session. Britain's FTSE 100 shed 0.4%, the DAX in Germany lost 0.6% and France's CAC 40 dipped 0.3%. The unemployment rate in Britain fell by 0.2 percentage point in the second quarter to 8%, according to the Office for National Statistics. The data came in better than expected, with the jobless rate at its lowest level in nearly a year. Asian markets closed lower. The Shanghai Composite dropped 1.1%, the Hang Seng in Hong Kong stumbled 1.2%, and Japan's Nikkei shaved off 0.1%. 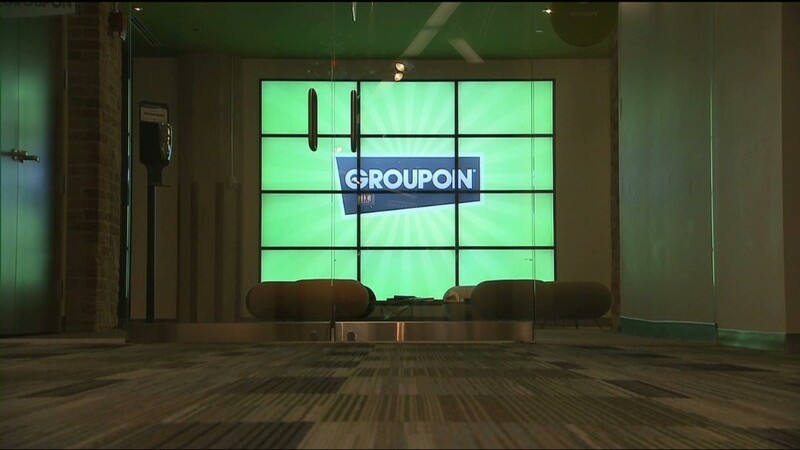 Groupon investors: Need a group hug? Economy: At 9:15 a.m. ET, the Federal Reserve will release data on industrial production for July, which is expected to have increased by 0.6%. After the opening bell, the National Association of Home Builders will release the August edition of its Housing Market Index, which is based on a survey asking NAHB members to rate the general economy and housing market conditions. The index is expected to stand at 35, unchanged from last month. Companies: Staples (SPLS) posted quarterly earnings of 22 cents a share, meeting analyst expectations. Shares of the office supply retailer fell more than 15% in premarket trading. Target (TGT) shares moved higher after the retailer reported earnings of $1.06 a share, beating forecasts. Deere (DE) missed forecasts by nearly 35 cents, the company reported Wednesday morning. Shares fell nearly 5% on the news. Oil for September delivery lost 30 cents to $93.13 a barrel. Gold futures for December delivery fell $7.10 to $1,594.30 an ounce. 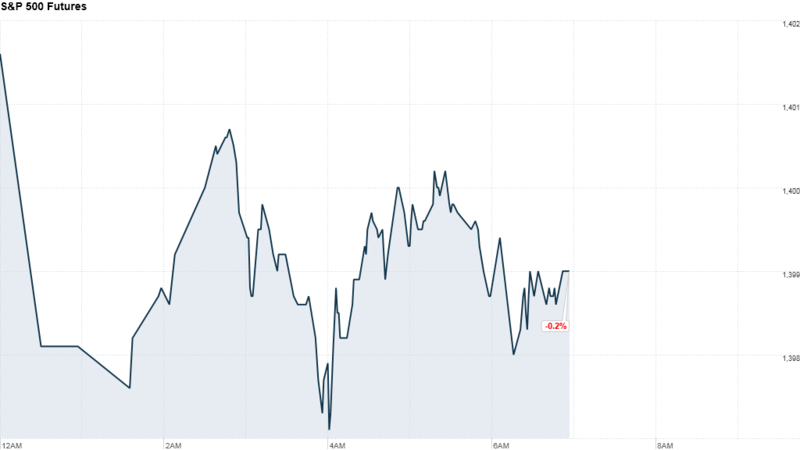 Bonds: The price on the benchmark 10-year U.S. Treasury remained unchanged, with the yield holding steady at 1.73%.